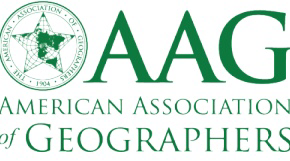 Website for the Black Geographies Specialty Group of the American Association of Geographers. The Clyde Woods Black Geographies Graduate Student Paper Award is given to the best paper on a Black geographies topic written by an MA or PhD student, who is a BGSG member. One (1) award will be given each year. The award winner will work with Antipode’s Editorial Collective to prepare their paper for peer review and, if successful, publication as an open-access article in the journal Antipode. The Black Geographies Specialty Group graduate student travel awards will be given to support graduate student travel to present a paper on a Black geographies topic at the AAG annual meeting. This competition is open to all MA/MS/PhD students. One (1) award to offset the cost of the student registration ($155.00) fee will be given. Detailed application instructions for both awards are available here. We are looking for a few more graduate students to participate in our upcoming Antipode Foundation funded conference: “Let Justice Roll Down Like Waters:” The role of spirituality in African American Environmental Activism. We will host the conference from March 1-3, 2018 at the University of Louisville. This conference brings together activists, spiritual leaders, and academics to explore the intersections of race, environmental activism and spirituality. From the times of slavery through the Civil Rights movement, spirituality has played a critical role in the radical activism of African Americans in the U.S. At the same time, spirituality has remained an understudied component of environmental activism. Through this conference, we intend to explore the role of spirituality among African Americans in environmental activism, and in the process, expand our understanding of environmental activism. How does spirituality influence African American involvement in environmental activism? What specific spiritual expressions do we see in African American environmentalism? How do African Americans spiritual engagement with the environment helps us to expand our definition of spirituality more broadly? How does an engagement with spirituality expand our understanding of what activism is? The conference will build on the themes introduced in the opening panel. It will be devoted to idea sharing, paper presenting, and collaborative learning. Conference participants will workshop papers or sermons prepared in advance by conference participants. We will also have plenty of opportunities for people to share best practices and vision for the future. The conference will conclude with a vision session for the future where both academic goals and community based goals will be discussed. The conference is organized around regional clusters to help to facilitate work beyond the conference. Participants will write a 750-1000 paper on the above themes related their work in environmental justice, food justice, or conservation. We are interested in scholars who are working closely with activists or spiritual organizations for their dissertation work. This work is supported by an International Workshop Award from the Antipode Foundation. Limited travel funding is available. Expressions of interest are invited to contribute to an edited book on Black Feminist Geographies. Unknowable: Geography and Black Feminisms articulates the empirical and philosophical work of Black women and Black feminisms in geography. The edited volume engenders a discussion concerning the legacies, trajectories, and possibilities of Black feminist intellectual and political traditions in geography. Black feminist geographies draw upon the conceptual and material underpinnings of Black feminisms and, in doing so, recognizes Black feminisms’ intellectual and physical necessity in the production of spatial knowledge. Katherine McKittrick’s seminal work Demonic Grounds: Black Women and the Cartographies of Struggle (2006) unsilenced the interplay of Black feminist thought and space, therefore disrupting geography’s complicit violence against Black women and Black geographies – through objectification, displacement, dismissal, and erasure. Given the widespread use of Black feminist thought and Black women’s spatialties in and beyond geography and building on the “Legacies of Black Feminisms” sessions at the 2016 Annual Meeting of the Association of American Geographers, the text will work against the commodification of Black women’s geographies and Black feminist thought through raw engagement with the roots/routes of Black feminisms, physical materialities, and imaginative configurations., the book will posit what Black feminisms can offer for understanding the workings of racism and racial capitalism; liberatory praxis and theory; and political and economic decolonization. The book will have an international and transdisciplinary focus to represent the range of approaches and perspectives on Black feminist geographies. Independent scholars, educators, practitioners, and graduate students across disciplines are invited to submit abstracts for consideration. Chapter proposal submissions should be in the form of: a 200-word author bio, chapter title, and chapter abstract (400-500 words). The book is being published with verbal interest by a top academic press. Alexander, M. J. 2006. Pedagogies of crossing: Meditations on feminism, sexual politics, memory, and the sacred. Cooper, B. 2017. Beyond respectability: The intellectual thought of race women. Collins, P. H. 2008. Black feminist thought: Knowledge, consciousness, and the politics of empowerment. Combahee River Collective. 1978. The Combahee River collective statement: Black feminist organizing in the seventies and eighties. Da Silva, D. F. 2014. “Toward a black feminist poethics: The quest(ion) of blackness towards the end of the world”. The Black Scholar, 44 (2). Davis, A. 1983. Women, race, and class. hooks, b. 1995. Killing rage: Ending racism. Mirza, H. S., ed. 1997. Black British feminism: A reader. ———. 2008. Amalgamation schemes: Antiblackness and the critique of multiracialism. Spillers, H. J. 1987. “Mama’s baby, papa’s maybe: An American grammar book.” Diacritics, 17(2), 64–81. Spillers, H., Hartman, S., Griffin, F. J., Eversley, S., & Morgan, J. L. 2007. “Whatcha gonna do? Revisiting “Mama’s baby, papa’s maybe: An American grammar book.” Women’s Studies Quarterly, 35(1/2), 299–309. Vargas, J. 2012. “Gendered Antiblackness and the impossible Brazilian project: Emerging critical black Brazilian studies.” Cultural Dynamics24(1), 3-11. Walker, A. 1983. In search of our mother’s gardens: Womanist prose. Wilderson, F. B. 2010. Red, white & black: Cinema and the structure of U.S. antagonisms. Weheliye, A. G. 2014. Habeas viscus: Racializing assemblages, biopolitics, and black feminist theories of the human. Wynter, S. 1990. “Beyond Miranda’s meanings: Un/silencing the ‘Demonic Ground’ of Caliban’s ‘Woman’.” Out of the Kumbla: Caribbean Women and Literature: 355-72. Barron, Melanie. 2017. “Remediating a Sense of Place: Memory and Environmental Justice in Anniston, Alabama.” Southeastern Geographer 57 (1): 62–79. Bledsoe, Adam. 2017. “Marronage as a Past and Present Geography in the Americas.” Southeastern Geographer. 57 (1): 30–50. Bledsoe, Adam, Latoya E. Eaves, and Brian Williams. 2017. “Introduction: Black Geographies in and of the United States South.” Southeastern Geographer 57 (1): 6–11. Blevins, Steven. 2016. Living Cargo: How Black Britain Performs Its Past. 349 pp. Minneapolis, MN: U of Minnesota P.
Calvente, Lisa B. Y. 2017. “From the Rotten Apple to the State of Empire: Neoliberalism, Hip Hop, and New York City’s Crisis.” Souls 19 (2): 126–43. Cooper, Brittney C. 2017. Beyond Respectability: The Intellectual Thought of Race Women. University of Illinois Press. Craft, Renée Alexander. 2017. “Between the Devil and the Deep Blue Sea.” Souls 19 (1): 91–107. Domosh, Mona. 2017. “Genealogies of Race, Gender, and Place.” Annals of the American Association of Geographers 107 (3): 765–78. Eaves, Latoya E. 2017. “Black Geographic Possibilities: On a Queer Black South.” Southeastern Geographer 57 (1): 80–95. Harris, Rosalind, and Heather Hyden. 2017. “Geographies of Resistance Within the Black Belt South.” Southeastern Geographer 57 (1): 51–61. Hawthorne, Camilla. 2017. “In Search of Black Italia.” Transition, no. 123: 152–74. Hawthorne, Camilla, and Brittany Meché. 2016. “Making Room for Black Feminist Praxis in Geography.” Society and Space. September 30. https://societyandspace.com/material/commentaries/camilla-hawthorne-and-brittany-meche-making-room-for-black-feminist-praxis-in-geography/. Kelley, Robin D. G. 2017. “What Did Cedric Robinson Mean by Racial Capitalism?” Boston Review, January. http://bostonreview.net/race/robin-d-g-kelley-what-did-cedric-robinson-mean-racial-capitalism. Kitada, Eri. 2016. “Commemorating Racial Violence: Street Naming and Segregation in New York City, 1999.” NANZAN REVIEW OF AMERICAN STUDIES 38: 21–34. Krupar, Shiloh, and Nadine Ehlers. 2017. “Biofutures: Race and the Governance of Health.” Environment and Planning D: Society and Space 35 (2): 222–40. Leeuuw, Sarah de, and Briar Craig. 2017. “Mapping Justice with Letter Press Printing: The Bold Type Work of Amos Kennedy.” ACME: An International Journal for Critical Geographies 16 (1): 138–48. McKittrick, Katherine. 2017. “Commentary: Worn out.” Southeastern Geographer 57 (1): 96–100. Mollett, Sharlene. 2017. “Celebrating Critical Geographies of Latin America: Inspired by an NFL Quarterback.” Journal of Latin American Geography 16 (1): 165. Montero, Carla Maria Guerrón. 2017. “‘To Preserve Is to Resist’: Threading Black Cultural Heritage from within in Quilombo Tourism.” Souls 19 (1): 75–90. Olund, Eric. 2017. “Multiple Racial Futures: Spatio-Temporalities of Race during World War I.” Environment and Planning D: Society and Space 35 (2): 281–98. Rodriguez, Akira Drake. 2016. “Remaking Black Political Spaces for Black Liberation.” Metropolitics, December. https://www.metropolitiques.eu/Remaking-Black-Political-Spaces.html. Shields, Tanya. 2017. “Magnolia Longing: The Plantation Tour as Palimpsest.” Souls 19 (1): 6–23. Slocum, Karla. 2017a. “Black Towns and the Civil War: Touring Battles of Race, Nation, and Place.” Souls 19 (1): 59–74. ———. 2017b. “Guest Editor’s Note.” Souls 19 (1): 1–5. Smith, Sara, and Pavithra Vasudevan. 2017. “Race, Biopolitics, and the Future: Introduction to the Special Section.” Environment and Planning D: Society and Space 35 (2): 210–21. Smith, Sarah Stefana. 2016. “Towards a Poetics of Bafflement.” University of Toronto. Sziarto, Kristin M. 2017. “Whose Reproductive Futures? Race-Biopolitics and Resistance in the Black Infant Mortality Reduction Campaigns in Milwaukee.” Environment and Planning D: Society and Space 35 (2): 299–318. Thomson Jr., Raymond (Profiling Jonathan Hall). 2017. “In Human Hands: The Future of the California Condor.” http://wvumag.wvu.edu/features/in-human-hands-the-future-of-the-california-condor. Towns, Armond R. 2017. “The ‘Lumpenproletariat’s Redemption’: Black Radical Potentiality and LA Gang Tours.” Souls 19 (1): 39–58. Williams, Bianca C. 2017. “‘Giving Back’ to Jamaica: Experiencing Community and Conflict While Traveling with Diasporic Heart.” Souls 19 (1): 24–38. Williams, Brian. 2017. “Articulating Agrarian Racism: Statistics and Plantationist Empirics.” Southeastern Geographer 57 (1): 12–29. Williamson, Terrion L. 2016. Scandalize My Name: Black Feminist Practice and the Making of Black Social Life. Oxford University Press. Woods, Clyde. 2017a. Development Arrested: The Blues and Plantation Power in the Mississippi Delta (with an Introduction by Ruth Gilmore). 2nd ed. Verso Books. ———. 2017b. Development Drowned and Reborn: The Blues and Bourbon Restorations in Post-Katrina New Orleans. Edited by Laura Pulido and Jordan Camp. Athens, GA: University of Georgia Press. Wright, Willie Jamaal. 2017. “Memorial for Alton Sterling, Baton Rouge, Louisiana, 2016.” Southeastern Geographer 57 (1): 1–3. Stay tuned for more from Black Geographies! 5119 Looking at High- and Low-Level Crime, Criminality, and Criminalization in a Geographic Context.